This is a super easy pasta salad that I love to make at any time of the year. 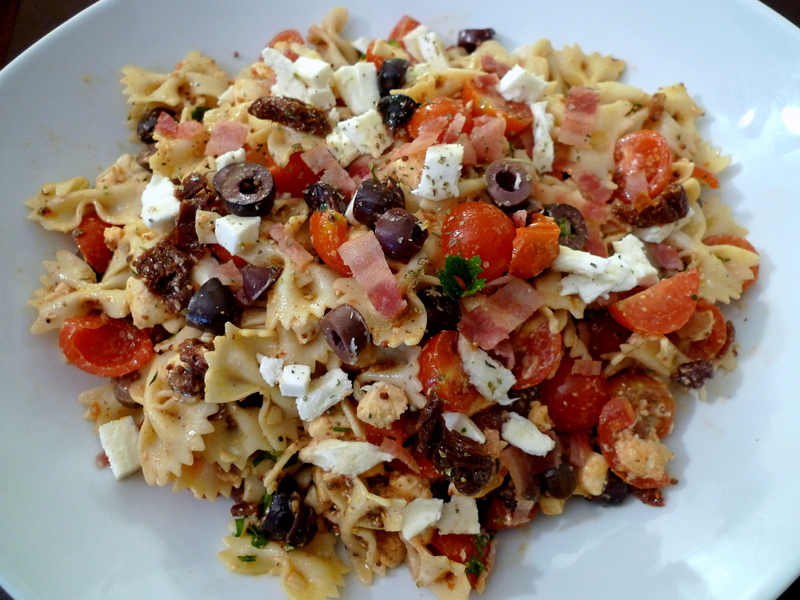 The pasta is full of rich Mediterranean flavors, and includes as medley of tomatoes, olives, sun-dried tomatoes, mozarella, and bacon. I have used feta cheese before although I think the milder mozzarella is a much better complement to the rest of the flavors. The smokiness of the crumbled bacon and sun-dried tomatoes are a fantastic combination to the sweet cherry tomatoes and olives. 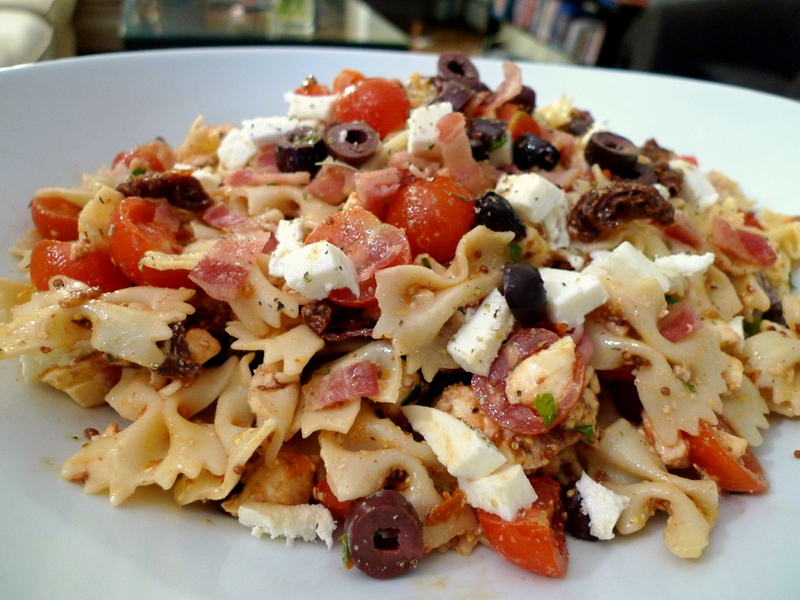 Natalya is a big proponent of a more “stuff” to pasta ratio and thus, I changed the recipe to double the amount of tomatoes, mozarella, olives, sun-dried tomatoes, and bacon that the recipe calls for. The recipe suggests using Italian, Greek, or Sun-Dried Tomato dressing but as I don’t normally buy any pre-made salad dressings, I have always just sort of made it up. The dressing I concocted is a mixture of olive oil, red wine vinegar, and dijon mustard and I think it works quite well. I always make this very ad hoc… lots of eyeballing of ingredients and tasting until it is perfect! Bring a large pot of water to a boil. Add a dash of salt and the farfalle pasta. Cook 8-10 minutes until tender and drain. Toss pasta with some olive oil (use the infused oil from the jar of sun-dried tomatoes) to prevent the pasta from drying out and clumping together. Set aside. Meanwhile, cook the bacon according to package directions. I prefer them very crispy! Cool slightly and then chop. 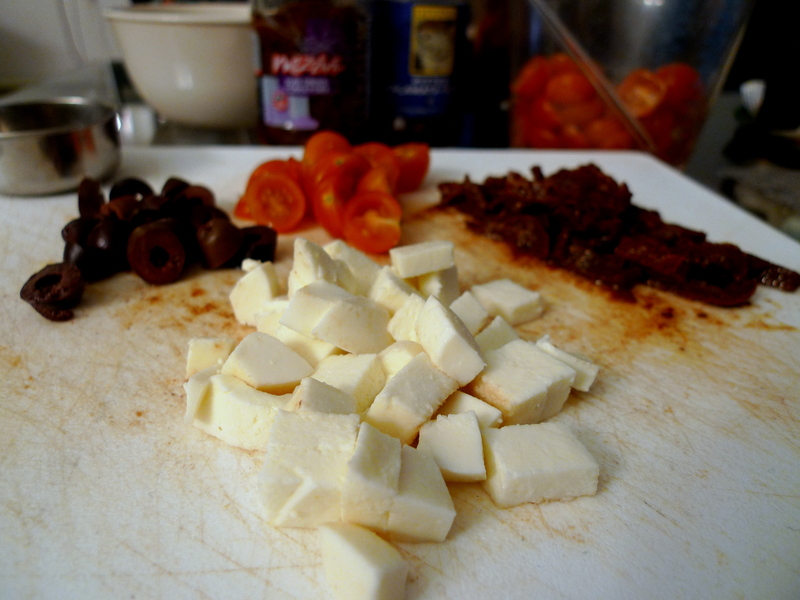 Also, chop up all the cherry tomatoes, sun-dried tomatoes, olives and mozzarella. In a large serving bowl, combine all the ingredients and gently stir. Serve warm. I can’t believe I’m the first person to leave feedback on this recipe. I just made it tonight for dinner (yes, it has enough goodies to constitute a meal – in my opinion) and am so satisfied that I had to jump online and post a review, which I never do. The different flavors are wonderful together in the same bowl. I made the dressing from the recipe provided and agree that it was better than a bottle. I prepared the salad using slightly less olives and cheese than called for – reducing them by 1/3 each. I omitted the dried herbs and used fresh chopped basil – YUM! Next time I think I’ll include fresh oregano as well. I’m more a fan of equal amounts of pasta to “stuff” and will be adding a little more pasta to this so that the pasta can make it’s mark on the dish as well – plus I could only find a 12oz. box at the market and don’t really want to store 4oz. of pasta. This is an outstanding recipe and my new favorite pasta recipe. I’m definitely saving it for the next pot luck or family gathering because it was SUPER easy and tastes great. yum fresh herbs do make everything taste better! ever since we got an aerogarden, we have been trying to add whatever we grow to everything! really glad you liked the recipe and thanks for your comments!